Inspired by this video, I am training my stock. I can see a musical effort at Olympia beckoning. Alas the KP Perfect Pony collection will not co-operate because of my refusal to allow each book to wear a hand-built Swarovski bookmark, but the rest are coming along very nicely, very nicely indeed. 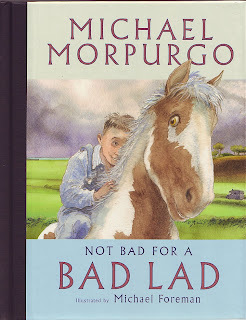 There a couple of authors about whom I lose all sensible distance when I pick up their books, and Michael Morpurgo is one of them. Add to this the fact that I am really quite silly about the Suffolk Punch, which my mother can remember being used on the family farm, and you have a recipe for me to start blethering on in a totally uncritical manner. 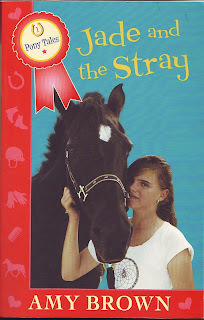 I'm clearing old stock, so have a look here if you'd like to pick up some cheap pony fiction. Hardbacks are £1.50, and paperbacks are 50p each, or 3 for £1.00; all plus postage. "What enables a nurse to walk past somebody dying of dehydration?" Well, I think I can answer that from what I have seen in my own village over the past week or so. It is a complete and utter inability to recognise that the elderly exist as human beings; that they are the same as you are. That they think, breathe, and feel. I think the number of times I post is often directly related to how much I am putting off what I know I should be doing. So, with that in mind, if there are any other fellow Antonia Forest fans out there, here is a link to some fanfic. I am now going to be good and get back to what I should be doing. If anyone has read any and has a favourite, please do say in the comments and I can then cut out at least one layer of prevarication (if prevarication has layers, which I think for the sake of argument I shall say it does) by going straight to your recommendations. There. That's been another 5 minutes. Back to the grindstone. Horses powered steamboats - who knew? Can't imagine it was a lot of fun for the horse. World Book Night is coming up on March 5th. Good idea or not? Cloud of the month at the Cloud Appreciation Society is a stunner. I spend more time than I ought staring at clouds out of the window, but I've never seen anything like this. How covers come to be: DIY iceberg. Now that the hens are laying again, I am starting to focus on recipes that use up a decent amount of eggs. Swiss roll only uses 3, but it's a start. Daughter and I made an excursion into baking (or at least she did - I directed operations). Here is a rather squint photograph of daughter doing the prescribed 10 minutes whisking. When I did domestic science at school (which is what cookery was then called), Swiss roll was one of the things we had to do. Of course, we had to do it all by hand, and I have bitter memories of my failure to beat the mixture enough, meaning my Swiss roll was a flat and rubbery failure. I wrote that one down to experience, thinking I'd never have to do it again. I am posting this picture because I am intrigued about it, and haven't yet been able to find out whether the practice was common or not. 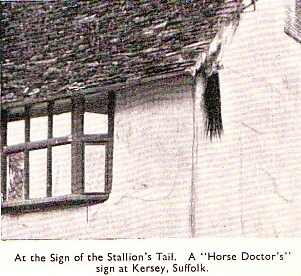 The picture below was sent in to Riding Magazine in the 1930s by Rupert Isaac of Ipswich, and shows a stallion's tail attached to a cottage in the village of Kersey. Isaac wrote: "....its meaning to the villagers is plainer than any signboard; for when your horse goes lame or your cow has colic, you seek the stallion's tail -- the device of the veterinary surgeon. When the first tail was hung out is a matter for conjecture, but the "horse doctor" was one of the earliest craftsmen, and Kersey is old indeed..."
Aaahh, ahhhh, bah bah bah bah bah. I love it. Thanks to Karen Dent for reminding me it existed. This I think lends a whole new dimension to plaiting. 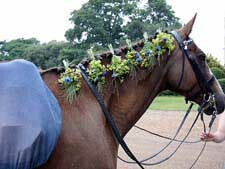 Were I ever to get married again (though I've done it twice and any more I think would start to look careless) I'd angle to have a horse with those plaits. They're brilliant. They're by local florist Foxtail Lilly. Thanks very much to Tracey Mathieson for permission to use the picture. How to be the effective mother of a pony-mad child, over at If Wishes Were Ponies.It's still winter over at Pony Book Chronicles.Juxtabook has an epic to-be-read pile.and lastly, gorgeous February pictures over at Tales From the Village. The British Library is under threat as never before. Our local village library is under threat of closure, along with seven others in the county. The council's aim seems to be to concentrate resources in the towns, and assume that most village inhabitants will be able to get to towns if they want to visit libraries. When this is allied with the prospective complete cut in the council's subsidy for rural buses, one wonders. Tomorrow, February 5th is Library Read-in Day. Voices for the Library has details of events in many libraries. Irchester Library is holding its own read in from 11.00am until 1.00pm. If you're in any way local, it would be great to see you there. Other local libraries supporting the Read-in are Roade and St James. 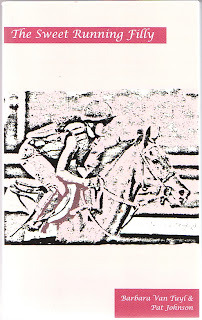 book two (Jade at the Champs) is available on Kindle. Jade and the Stray doesn't appear to be buyable in the UK. I am ashamed of how long it has taken me to review these books, particularly Amy's which sank without trace in my office, - to be accurate, not completely without trace, as it resurfaced when I had an reorganisation and major tidy up recently.